Brick Town Talk: Mod and Trad - LEGO Town, Architecture, Building Tips, Inspiration Ideas, and more! Clermont-Ferrand, France - (BTT) The 1970s brought the world a few things that are probably better left in the past: disco, bell-bottoms, 8-Tracks. Many of the architecture from the era also gets clumped into this category, but this wonderful brown and tan apartment proves that a few architectural gems did manage to see the light. Playing off of the detailing and massing of its more classical blue and white neighbor, this pair proves that new and old can coexist in perfect harmony. 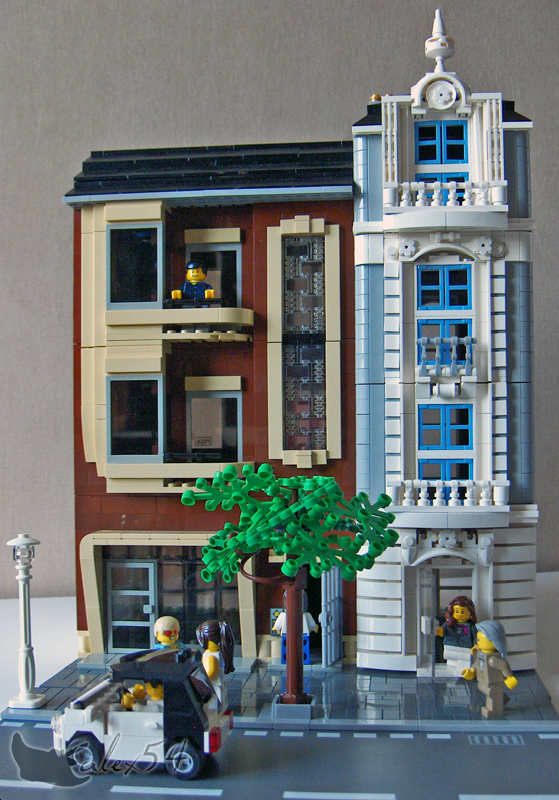 Please feel free to join the discussion on these buildings at the Eurobricks forums. There are a lot of really great features on this building. Time to take some notes!